Mindful of the nullification of Steven Gerrard at the hands of man-markers like Gabby Agbonlahor and Stewart Downing in recent weeks, Roberto Martinez selected a 4-6-0, with false nine Steven Naismith tasked with picking up the Liverpool captain. Martinez would have expected Gerrard to again fulfill the lone holder role in front of his rivals’ defence. Brendan Rodgers, however, opted for two holders, with Jordan Henderson fielded in a box-to-box role beside Gerrard. Adam Lallana got a start in his preferred number ten position, which saw him faced with Everton’s anchorman Gareth Barry. Naismith had great success in his primary task, and Steven Gerrard’s influence on his side’s attacking play was minimal. In the 27th minute, Dejan Lovren could be seen looking to feed his captain in Liverpool’s own half, only to find him marked by the Scot. He opted to carry the ball himself and attempt a long diagonal to Markovic on the right, which missed its target. This is the kind of ball that Gerrard should have been playing. Of course, the attention paid to Gerrard meant that Henderson was often free, with his man Besic not keen to jeopardise his side’s defensive shape by coming too far forward to press. In the opening minutes he received possession in the middle after Gerrard was closed by Naismith, before threading a perfect through ball into the channel for Balotelli. Unfortunately for Liverpool, the Italian had just strayed offside. Another Henderson through ball found its mark just before half-time after Lallana forced Gareth Barry into a turnover. This time Sterling was the recipient and he forced a save from Tim Howard at his near post. Everton’s failure to get right-back Seamus Coleman fit for this fixture resulted in the appearance of Tony Hibbert’s name on the team-sheet, a player who endured a roasting at hands of Swansea’s Jefferson Montero in mid-week in what was his his first start after returning from a long injury lay-off. Consequently, Liverpool fielded Raheem Sterling on the left of their 4-2-3-1 and funneled most of their play down that flank in a bid to take advantage of Hibbert’s lack of match sharpness. Helping their cause was the positioning of Romelu Lukaku on Everton’s right, who had clearly been asked by his manager to stay high in the defensive phase. With left-full Alberto Moreno making untracked runs past Lukaku and striker Balotelli drifting over to that flank too, Everton looked in danger of being completely overrun out there. Liverpool, in blue, focused their attacking play overwhelmingly down the left. 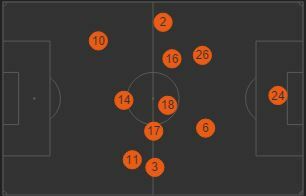 Everton, in orange, looked to counter-attack in behind Liverpool’s full-backs with attacks through the middle few and far between. Much credit must go to James McCarthy for preventing this. Fielded on the right of a central midfield three, McCarthy toiled manfully to mostly limit Liverpool to speculative Balotelli pot-shots from that side. Sure they generated a couple of genuine chances. Another Moreno run and cross on the half-hour should have been headed home by Balotelli. And when Sterling beat the tiring Hibbert to cross in the 67th minute, the Italian hit the bar when scoring seemed a must. But thanks to the game’s top tackler in McCarthy (with six) and some wasteful shooting from Balotelli, Everton weathered the storm. 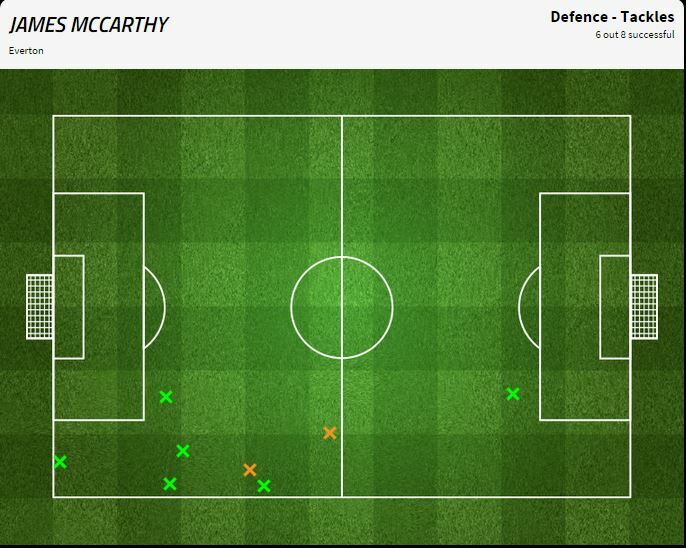 McCarthy worked brilliantly to stem the flow on his side’s right flank. One would guess from his tackle-map above that he was fielded as a right full-back on the day. Everton’s strategy in attack was more than a little confused. As mentioned above, they were keeping Lukaku high on the right in the defensive phase. This meant that the obvious first ball out of defence was the quick pass in behind Liverpool’s advanced left full back. Indeed, Everton attempted a number of these passes. Unfortunately for them however, they generally arrived after some ponderous short passing between their two centre-backs and Barry that allowed the opposition to get set. When they did find Lukaku, the Belgian was incredibly wasteful, misplacing numerous cross-field balls and exhibiting extremely poor decision making. Looking to feed Mirallas (and his replacement McGeady) more often in behind Manquillo on the other side may have paid greater dividends. Another side-effect of Everton’s chosen strategy was the lack of a penalty box presence. With Naismith dropping deep to occupy Gerrard, Everton often had no central target to cross to when breaking at Liverpool. This was most obvious in the 26th minute, when the abject Markovic’s poor clearance let in Baines, who squared across the six-yard box to no-one in particular. Gareth Barry looked a little overrun in front of his side’s defence. He was booked for two fouls in the first nine minutes and was forced into a number of errors in possession. So it was little surprise when he was dispossessed in the lead-up to the foul that produced Gerrard’s successful free-kick opportunity, even if it was ultimately a foul from Balotelli that caused him to lose possession. With McCarthy forced wide to stem the flow on the right and new boy Besic struggling to his left, Barry was uncomfortable to say the least. His problems were eased after the goal, as Liverpool flipped to a 4-5-1, with Gerrard back in his anchorman role and Lallana going wide. Immediately the now free Barry pinged an inch-perfect cross-field ball to Lukaku, who predictably wasted it. Barry was now marking no-one. With Everton chasing the game, surely Martinez would dispense with an anchorman and go 4-2-3-1 or even 4-4-2 right? Nope. Samuel Eto’o was introduced for Besic and took up a more traditional number nine role. What of Naismith? He took up Besic’s left-of-centre midfield position! Unbelievably negative. Only a one-in-one-thousand thunderbastard of a strike from Phil Jagielka at the death spared Martinez’s blushes. Everton looked like creating nothing and, in truth, deserved nothing either.